The OMEGA® iSeries is a family of microprocessor-based instruments offered in two true DIN sizes with NEMA-4, IP65 rated front bezels. All of the instruments share the same set-up and configuration menu and method of operation, a tremendous time saver for integration of a large system. The iSeries displays feature unique 9-segment LED characters which greatly improves alphanumeric representations. The 7-segment LED characters found on most instruments are adequate for presenting numbers, but not letters. Words are easier to read with the unique 9-segment LED characters on the iSeries, which makes operating and programming simpler and easier. The OMEGA® iSeries are the first complete series of 1/8, 1/16 and 1/32 DIN process control instruments with totally programmable color displays. The display can be programmed to change color at any set point or alarm point. For example, the instrument can be programmed to display the process value in GREEN during warm-up, switching to AMBER to signal the normal operating range, and in RED to signal an alarm condition. The changes in color are quickly seen from a distance, and machine operators can intuitively react to changing conditions. The colors can be programmed to change back when the value drops back below the alarm point or to "latch" on until being reset by the operator. The instrument can also be programmed to display only one unchanging color: GREEN, AMBER, or RED. This is a useful way to let an operator identify, at a glance, process values in three separate locations, or to display three different measurements such as Temperature, Pressure, and Flow. The innovative OMEGA® iSeries of meters/controllers features an extended Five (5) YEAR warranty at no extra charge. The iSeries packs a wealth of power and features into the smallest of packages, utilizing COB (chip-on-board) and SMT (surface mount technology) assembly techniques and automation. Every iSeries instrument is thoroughly calibrated and tested at several stages throughout production. The iSeries offers the highest accuracy for industrial instrumentation at 0.03% of reading. The analog-to-digital conversion utilizes proprietary 20-bit ASIC (application specific integrated circuit) patented algorithms and smart filtering. The innovative iSeries offers the broadest selection of signal inputs available on one industrial instrument. The choices are easily selected from the Menu with four front panel pushbuttons, or by serial communications. 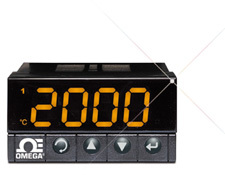 The OMEGA® iSeries measures process voltage: 0-100 millivolt, 0-1 Volt, 0-10 Volt ranges, and process current: 0-20 mA. The optional analog output can be programmed within a range of 0-10 Vdc or 0-20 mA. It is selectable as either a control output or as a calibrated retransmission of the process value-a unique feature among controllers. The iSeries comes standard with built-in 10 Vdc @ 60 mA or 5 Vdc @ 40 mA excitation for transmitters or other devices. Built-in excitation is not available with optional Isolated RS-232/RS-485 Serial communications. The iSeries can control simple manual operation to ON-OFF and full Autotune PID control. (Selectable preset tune, adaptive tune, PID, PI, PD control modes.) The dual control outputs can be configured for a variety of independent control and alarm applications. The ramp-to-setpoint feature allows the user to define the rate of rise to setpoint, minimizing thermal shock to the load during start-up. Maximum ramp time: 99.59 (HH.MM), Soak: 00.00 to 99.59 (HH.MM), Damping: 1 to 8 in unit steps. Input types: 0 to 20 mA, 0 to 100 mV, 0 to 1 V and 0 to 10 Vdc. Free software is provided for easy set-up, configuration and data acquisition with the OMEGA® iSeries. Free ActiveX Controls are provided for the iSeries, making it easy to integrate the iSeries with information systems using "ActiveX Containers" such as Microsoft Visual Basic and Microsoft Excel as well as with popular OLE and OPC compliant data acquisition, process control, and industrial automation software from OMEGA®, GE Fanuc, Intellution, Rockwell Automation, Object Automation, iconics, and Wonderware among others. The iSeries are the first intelligent industrial instruments to offer both RS-232 and RS-485 serial communications in one instrument which can be selected from the menu. The iSeries features both the iSeries serial protocol. If Modbus is required, we recommend our latest Platinum meters - DPPT Series. Make installing your iSeries meter or controller easier by ordering it preconfigured by the factory, at no extra charge. You specify the input types, scaling if applicable, set points, alarm points, etc. and we will program the instruments to your specific requirements in our calibration lab prior to shipment. For a checklist of factory setup parameters, please consult your OMEGA® applications engineers. The Factory Setup and configuration option requires the serial communication " -c24 " option.